In 2008, I went on a relaxing, stress-free eight-state spring break college tour with my older son. During that trip, I discovered that my child was in deep trouble because he would be competing against kids who had been padding their resumés since third grade, and he had not yet invented an antibiotic. 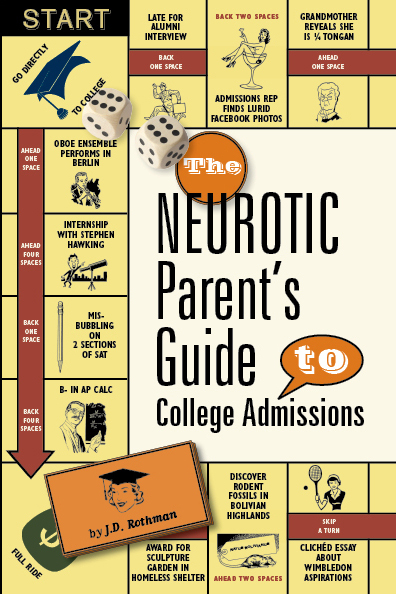 This inspired my blog about the insanity of the college process, www.theneuroticparent.com.The blog was soon discovered by the director of admissions at Kenyon College, who published an excerpt in her book, I’m Going to College, Not You. (St. Martins Press, 2010). Now, after surviving a nine-state tour with my younger son, I am ready to reveal all…from when to start your preschooler in Kumon to whether to ask the Dalai Lama for a letter of recommendation. Copyright © 2014 JDRothman.com | All Rights Reserved | If you discover any problems with my site, please harass my designer.